Annual vaccinations — Vaccine protocols are tailored to the specific needs of your pet. Whether you hunt with your dog or travel across the country with your cat, we can make vaccination recommendations to specifically suit your pet’s lifestyle dependent upon the risks they may encounter. New Pet/Puppy/Kitten Wellness Checks — Your first visit with your new pet, whether young or old, is dedicated to covering any questions you may have about housing, training, behavior, diet, and care. During this time, your pet can be screened for potential health problems and intestinal parasites/fleas/ticks before entering its new home. We can also assist you in choosing monthly preventatives and pet care products. Geriatric — Sometimes your older pet doesn’t need any vaccines yet but may be acting lethargic, or slowing down, or behaving strangely. These may be early warning signs to underlying metabolic or orthopedic diseases. Schedule an appointment to discuss your pet’s changing lifestyle and screen for potential organ insufficiency or infection. Presurgical — If your pet has not been seen by our veterinarians within the previous 2 months, you should schedule a presurgical physical exam. These visits can often be scheduled on the morning of the procedure. 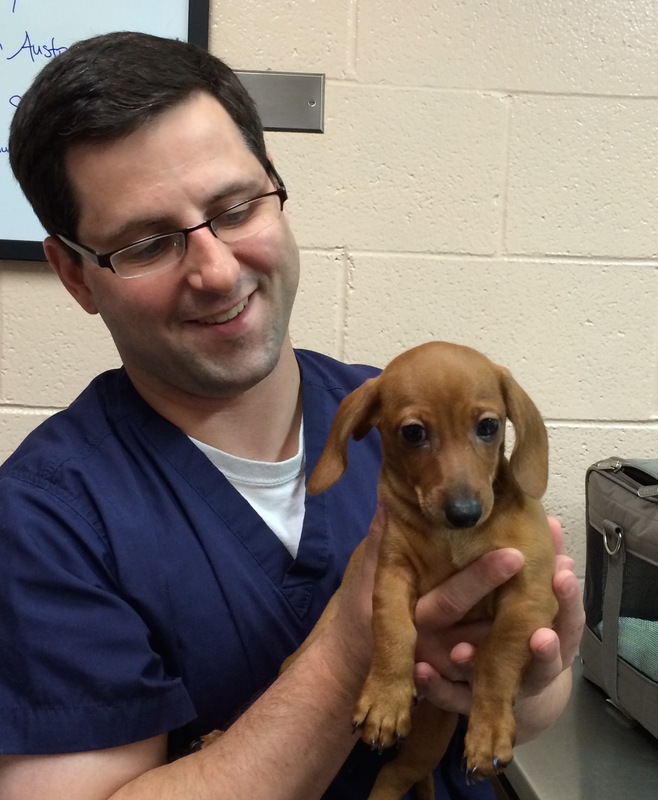 Parasite testing — During routine vaccination visits your pet is often tested for intestinal parasites and heartworms. Dogs that are used for hunting, go on vacations to beaches, or hike with their owners should be tested for tick-borne diseases IF they have a history of ticks previously embedded in the skin AND they show clinical signs such as intermittent shifting leg lameness, lethargy, waxing/waning fever, inappetance, or swollen limbs. Client education — Many problems require additional time for consultation and questions. Allergies, behavioral problems i.e. inappropriate elimination, aggression, separation anxiety, seizures, pre-breeding exams/testing, or new puppy/kitten litter exams can be scheduled as longer appointments to allow adequate time. Second opinion/Consultation — You may seek time with one of our veterinarians to re-evaluate your pet for a pre-determined health condition or to have additional diagnostics performed at our hospital. Pre-travel/health certificates — All of our veterinarians are accredited to perform physical exams for international travel for established clients and pets. Commercial airlines often require official documentation of a physical exam called a health certificate before travel within the United States, whether shipped in the coach cabin or in the cargo hold. Call your airline for further details, allowing the necessary time before travel for an exam. Please keep in mind that International Health Certificates needs are determined by the country of entrance. Some countries have a very long list of requirements and can have lengthy periods of quarantine for your pet. Though our veterinarians are accredited to perform physical exams for international travel and complete and sign the certificate, that is all they are accredited to do. We do not stock International forms or the varied list of requirements for any country outside the USA. Please do all research and obtain the needed documents before you schedule your International Health Certificate appointment. If traveling Internationally, you may want to consider hiring a company that handles everything from pet travel arrangements to documents to receiving your pet at the country of origin. A good place to start is the intended country’s embassy or the APHIS website.